The area now known as Guilford Township once was an unbroken wilderness along White Lick Creek and was occupied by the Delaware Indians. White settlers began to arrive in numbers after the 1818 Treaty of St. Mary's secured the area for settlement. The town of Plainfield came about in this way: a tract of land which included the area now known as Plainfield was obtained by Jeremiah Hadley of Preble County, Ohio, in 1822. Ten years later he sold it to his son, Elias Hadley. Levi Jessup and Elias Hadley laid out the town in 1839. Plainfield became incorporated as a town in 1839, but the incorporation charter was given up because of unsuccessful attempts at town government. Township trustees at the time felt township rule was preferable. On June 25, 1904, Plainfield was incorporated a second time as a town, and this time the incorporation stuck. Over the years, Plainfield has become associated with the Quakers. Although they were not the first denomination of Christianity to settle in the Plainfield area, the Quakers quickly became well-established, and in 1858 when the Western Yearly Meeting of Friends was organized, their house of worship was set up on Plainfield's Main Street. Although the original building burned down, it was replaced and the Western Yearly Meeting still takes place there. The Plainfield "Quaker" is the mascot of the high school. Plainfield has long been associated with the national road, U.S. 40, which goes through town as "Main Street." One incident which brought Plainfield national attention occurred in 1842 when President Martin Van Buren was spilled purposefully from his stage coach into the thick mud of the highway. The practical joke came as a result of Van Buren's vetoing a bill from Congress to improve the highway, a move which angered Western settlers. When Van Buren came through Plainfield on a swing to shore up his popularity for the 1844 election, a group of perpetrators set up the incident. The elm tree whose roots caused the president's carriage to topple became known as the Van Buren Elm. By 1850, the population of Hendricks County was 14,083. The people in the county developed a strong farming empire from the rich soil available in the region. Corn, wheat, oats, and soybeans were taken to Indianapolis and Cincinnati to sell at markets. In 1914, two-thirds of the population of the county lived in the country and farmers owned more than 90 percent of the taxable property. As more people moved to the county, Plainfield, along with Danville and Brownsburg, began to grow as commercial centers. 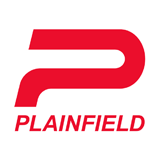 Throughout the 20th century, Plainfield continued to grow steadily. Since the beginning of settlement in the area, Plainfield and Guilford Township have had the largest concentration of population in Hendricks County. Today, the town's population exceeds 30,000 and its limits stretch from the Marion County line on the east into Liberty Township on the west, and from CR 100S in Washington Township on the north to south of I-70 on the south.